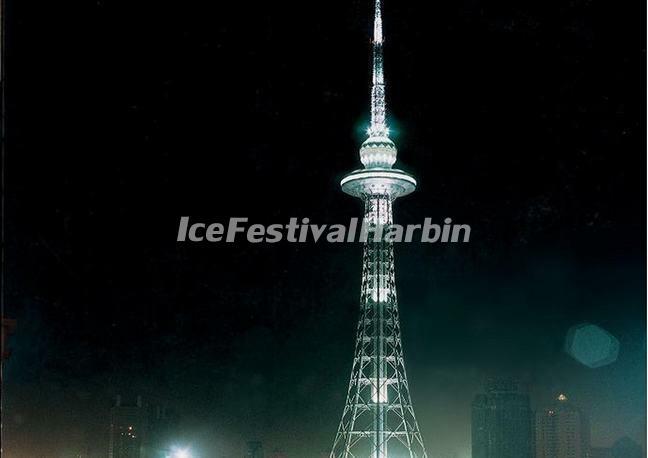 The Dragon Tower in Harbin, the highest steel-structure tower in Asia, makes icon of the nation's leading scenic spots in terms of infrastructure and service quality. Construction of the 336-meter-high Dragon Tower began in 1998 and was completed and opened to the public in October 2002. The tower is multifunctional and combines TV and broadcast transmissions, sightseeing, catering, entertainment, popular science, wireless communications, and environmental and meteorological monitoring as well. The tower has a floor space of 16,600 square meters, including 13,000 square meters of foundation floors and 3,600 square meters of tower floors. Various tourism and catering facilities have been built in the tower to entertain visitors. A police museum on the second floor showcases a gun used at the founding ceremony of the People's Republic of China, an automatic fingerprint identification system, and vivid depictions of police stories. Also on the same floor is a holy altar of the Red Emperor and the YELLOW Emperor. On the third floor is a corridor of world landscapes, a popular science base for youth and an exhibition hall for the terracotta warriors and horses of the Qin Dynasty (221-206 BC). A Dragon's Legend Exhibition Hall is located on the same floor, which displays pictures and sculptures of dragons in various forms. Alongside the exhibition hall is the Dragon's Offspring Wax Figure Museum. In China, Thus the museum shows wax figures of 20 illustrious emperors from ten ancient dynasties. 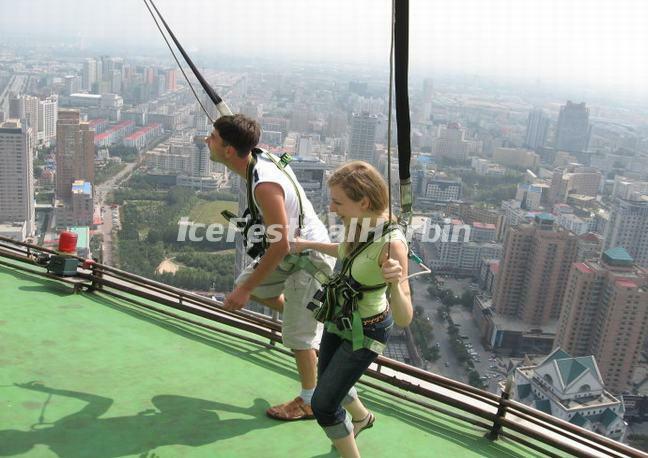 From the third floor, the tourist can take a sightseeing lift to visit the tower and you will find yourself above the tree line, and unfurling below you, a marvelous view of Harbin. The lift will first take the visitor to the "Walking-on-the-Clouds" Corridor at an altitude of 181meters. The corridor, making up of 80 pieces of transparent glass, is a 60-meter-long. It is said to be the longest of its kind in the world. Each square meter of the glass can carry a load of 1,000 kilograms, thus it offers an adventurous but definitely safe and rewarding experience to the visitor. At the altitude of 186 meters is the largest rotating restaurant in China. The restaurant features Chinese and Western foods with a seating capacity of approximately 300 people at a time. At the altitude of 190 meters, an outdoor platform provides the visitor with a panoramic view of the city and the Songhua River. Also at the same altitude is a butterfly exhibition hall. Approximately 16,000 kinds of butterfly specimens, including rare species from Argentina, Jamaica, Indonesia, the Philippines, Japan, Myanmar, Afghanistan, and Iran, are on show. The Qifu Temple was built at an altitude of 203 meters. It now serves as a museum for artifacts of the Jin Dynasty (1115-1234), a dynasty, which had its origin in Northeast China. Another museum is located at an altitude of 206 meters. Which displays historical relics from the Warring States period (475-221 BC) such as swords, ceramics, and the Ming-dynasty Buddha sculptures.